Our product range includes a wide range of zinc picolinate, venlafaxine hydrochloride, ursodeoxycholic acid, tranexamic acid, thiocolchicoside and theobromine sodium salicylate. Zinc Picolinate (17949-65-4) is Solid. it is also known as. Storage: Keep container tightly closed. Keep container in a cool, well-ventilated area. Venlafaxine hydrochloride (99300-78-4) is powder. It is also known as Venlafaxine hcl. it is use in Antidepressants Industry. Venlafaxine hydrochloride (99300-78-4) is Solid. It is also known as Venlafaxine hcl. it is use in antidepressant Storage: Keep container tightly closed. Keep container in a cool, well-ventilated area. Waste Disposal: Waste must be disposed of in accordance with federal, state and local environmental control regulations. Ursodeoxycholic Acid (128-13-2) is white powder. It is also available in multiple packaging. Tranexamic Acid (1197-18-8) is Solid. it is also known as trans-4-Aminomethyl cyclohexanecarboxylic acid . it is use in Oncology API and Pharmaceuticals Industry. Storage: Keep container tightly closed. Keep container in a cool, well-ventilated area. Thiocolchicoside (‎602-41-5) is powder. Storage: Keep container tightly closed. Keep container in a cool, well-ventilated area. Theobromine Sodium Salicylate (8048-31-5). It is also known as Sodium Salicylate Theobromine. Thalidomide (50-35-1) is powder White. it is use in Oncology API and Pharmaceuticals Industry. Storage: Keep container tightly closed. Keep container in a cool, well-ventilated area. Rasagiline Mesylate (161735-79-1) is solid. It Is also available in multiple packaging. Riboflavin 5-phosphate sodium (130-40-5) is powder. It is also known as Riboflavin 5-Monophosphate Sodium Salt. Storage: Keep container tightly closed. Keep container in a cool, well-ventilated area. Waste Disposal: Waste must be disposed of in accordance with federal, state and local environmental control regulations. Sevelamer Hydrochloride (152751-57-0) Not Found it is also known as Sevelamer Hcl. Storage: Keep container tightly closed. Keep container in a cool, well-ventilated area. Sodium Stearyl Fumarate (4070-80-8) is Solid. Storage: Keep container tightly closed. Keep container in a cool, well-ventilated area. Sorafenib Tosylate (475207-59-1). it is also known as Sorafenib p-toluenesulfonate . it is use in Oncology API and Pharmaceuticals Industry. Storage: Keep container tightly closed. Keep container in a cool, well-ventilated area. Sodium Feredetate is liquid.Sodium Feredetate is liquid. Storage: Keep container tightly closed. Keep container in a cool, well-ventilated area. 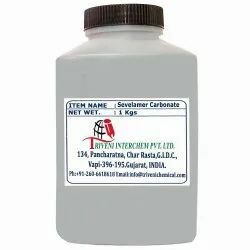 Sevelamer carbonate (845273-93-0). It is also available in multiple packaging. Roxithromycin (80214-83-1) is solid. it is use in macrolides, Antibacterial, swallowing and infections Industry.Roxithromycin (80214-83-1) is solid. it is use in macrolides, Antibacterial, swallowing and infections Industry. Reserpine (50-55-5) is crystalline beige. Storage: Keep container tightly closed. Keep container in a cool, well-ventilated area. Pyrilamine Maleate (59-33-6) is Solid. it is also known as Storage: Keep container tightly closed. Keep container in a cool, well-ventilated area. Metaxalone (1665-48-1) is solid. it is also known as Storage: Keep container tightly closed. Keep container in a cool, well-ventilated area. Valacyclovir Hydrochloride (124832-27-5) is solid. It is also known as Valacyclovir Hcl. it is use in antiviral, herpes virus and herpes simplex Industry. L-Carbocisteine (638-23-3) is light yellow powder. It is also known as Carbocysteine and S-Carboxymethyl-L-cysteine. it is use in chronic obstructive pulmonary disease and bronchiectasis Industry. Storage: Keep container tightly closed. Keep container in a cool, well-ventilated area. Waste Disposal: Waste must be disposed of in accordance with federal, state and local environmental control regulations. Irinotecan hydrochloride (136572-09-3) is Powder. 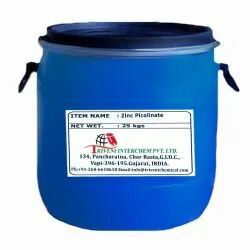 It is also known as Irinotecan hcl, ester monohydrochloride . it is use in colorectal cancer, Colon cancer, metastatic cancer and Oncology Industry. Storage: Keep container tightly closed. Keep container in a cool, well-ventilated area. Waste Disposal: Waste must be disposed of in accordance with federal, state and local environmental control regulations. Clomiphene Citrate (50-41-9) is solid. It is use in Infertility Industry. Vitamin E (10191-41-0) is Yellow-Brown Viscous Liquid. Vitamin C (50-81-7) is Solid. It is also known as L-ascorbic acid. Tiapride hydrochloride (51012-33-0) is solid. It is also known as Tiapride hcl. It is also available in multiple packaging. Thiopental Acid (76-75-5) is solid. Theofibrate (54504-70-0). It is also known as Etofylline Clofibrate. Storage: Keep container tightly closed. Keep container in a cool, well-ventilated area. Waste Disposal: Waste must be disposed of in accordance with federal, state and local environmental control regulations. Theobromine (83-67-0) is white solid. It is use in Bronchodilators and Vasodilators Industry. Sunitinib Malate (341031-54-7) is solid. it is use in Oncology API and Pharmaceuticals Industry. Storage: Keep container tightly closed. Keep container in a cool, well-ventilated area. Dorzolamide hydrochloride (130693-82-2) is solid. It is also known as Dorzolamide hcl. It is also available in multiple packaging. Valganciclovir (175865-59-5) is solid. It is use in Cytomegalovirus Retinitis and Cytomegalovirus Industry. Travoprost (157283-68-6). It is also available in multiple packaging. Looking for API For Syrup ?